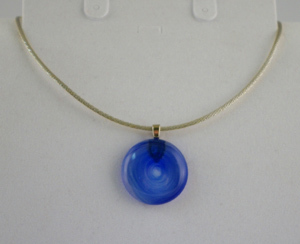 The pot melt pendant is made by putting clear and coloured glass in a very small clay pot on a stand in the kiln. The kiln is slowly heated to 1760 degrees until the glass drips down through the hole in the flower pot making a small circular puddle on the floor of the kiln. This makes each piece one of a kind.